Looking to purchase a Toyota forklift? Well you picked a good one. Toyota Forklifts have been the number one selling forklift for a long time. They make a quality product that is dependable and high quality, two great reasons to own one. But there are other options that may be better for you. Have you ever considered owning a new Hyundai Forklift? Hyundai is a Korean word chosen for its English translation: “modern”. With their commitment to quality and user comfort, it is easy to see how the company name serves as an inspiration to their designs. Produced by Hyundai Heavy industries, a division of the mammoth worldwide Hyundai Corporation, Hyundai has been producing high-quality products for some of the World's most demanding operations. For decades Hyundai has quietly crept up the charts and is positioning itself to be a dominant force in materials handling industry. A recent Wall Street Journal article highlights how the focus and drive of Hyundai Auto has been paying off in the auto industry, where Hyundai is now the fifth largest auto manufacturer in the world. According to the same article, Hyundai’s auto products have been so successful that Hyundai has needed to double its production output over the past ten years. During this same time period, Toyota and Volkswagen have grown their auto production by only 40%. 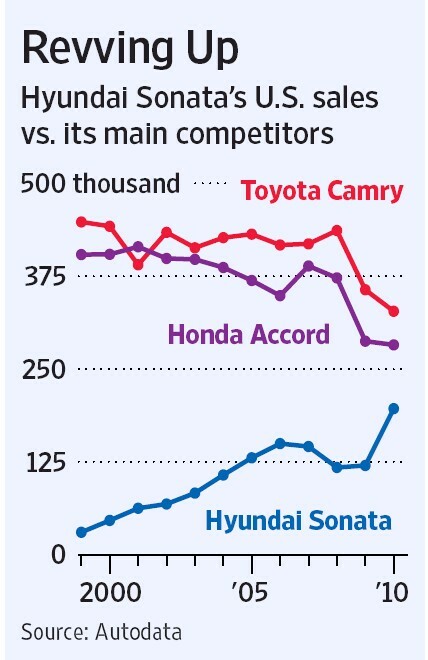 The chart below from the WSJ, shows how demand for Hyundai Sonata has grown dramatically, compared to Toyota and Honda. So how do Hyundai Forklifts stack up against the competition, like Toyota? On paper the product is much better. To begin with, you can purchase a 5,000 lbs Cushion Tire Hyundai for $3,000 - $4,000 less. Then you must consider the fact that Hyundai sells all of their lifts with a manufacturer’s warranty of three years. This is three times as long as anyone else in the industry. How can they do this? When you make a quality product, you are not afraid to stand behind it. Lastly, but definitely not least important, is what you get for the money. The Hyundai 25LC-7A forklift, which is Hyundai’s 5,000 lbs lift, utilizes the same engine they have put in their Sonata automobiles. This engine has 20% more power than the competitions and is Tier IV compliant. Last year Hyundai updated the Sonata, which has resulted in comparisons with the Mercedes Clk, a car that sells for four times the price. This year, Sonata Sales are up 35%. Reputation and track records are important. They don’t come easily and the competition needs to work hard to provide a product that will outperform them. Hyundai is doing that and the result is something you should look into. Detroit is aware of the competition that Hyundai is becoming. "In terms of momentum, [Hyundai] is a bigger threat right now than anyone else," says Bob Lutz, former vice chairman of GM, who still consults for the Detroit car maker. "I worry about them a lot. Yes i always buy Forklift Cover for my business. I always prefer discountforkliftcovers.com to buy Forklift Enclosures. Is the amount of money you can save worth such a headache with fitting one forklift for other car? And can you be sure everything will working right? I don't think so. I think it's better to spend money once, but be sure everything is fine. Like it's better to buy papers from pro papers, then finding some cheaper, but worse service.